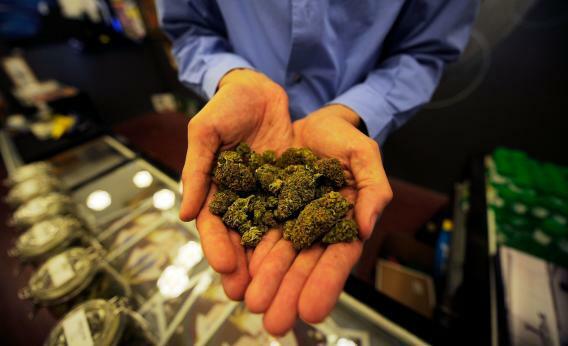 Medical marijuana legalized in Massachusetts in ballot approval. The owner of a medical marijuana dispensary displays marijuana buds in Los Angeles. Even if their guy didn’t win the main event, some Massachusetts voters will still have some consolation to ease their pain in the morning. The Associated Press has projected that Bay State voters have voted to approve the use of medical marijuana, and it appears to have passed by an overwhelming margin. This proposed law would eliminate state criminal and civil penalties for the medical use of marijuana by qualifying patients. To qualify, a patient must have been diagnosed with a debilitating medical condition, such as cancer, glaucoma, HIV-positive status or AIDS, hepatitis C, Crohn’s disease, Parkinson’s disease, ALS, or multiple sclerosis. The patient would also have to obtain a written certification, from a physician with whom the patient has a bona fide physician-patient relationship, that the patient has a specific debilitating medical condition and would likely obtain a net benefit from medical use of marijuana. Under the measure, approved patients are allowed to possess “up to a 60-day supply of marijuana.” How much is 60 days worth of weed? That’s up to the state’s department of public health to decide. According to The Boston Globe’s Boston.com, every New England state except New Hampshire has now legalized some form of medical marijuana. Similar proposals are also set to be decided in Washington, Arkansas, Colorado, and Oregon. Update, Nov. 6, 2012: The Colorado measure, a big one, also seems likely to pass. For more on that, head over to Yglesias. Update, Nov. 7, 2012: Voters have also spoken in Washington state, where recreational use will be legal effective Dec. 6.